Every year ReLife takes students to youth camp for life changing moments with a ton of fun for a week they will be talking about the rest of their life! Because this camp, like many summer camps, is expensive, we want to partner with you, the Church, by offering every student the opportunity to raise some of the funds. We would love for every family to be able to send their 6th - 12th graders to Lakeview Camp, July 25th - 29th! If you are interested in partnering with us, we simply need to know you are willing to participate in this fundraiser. 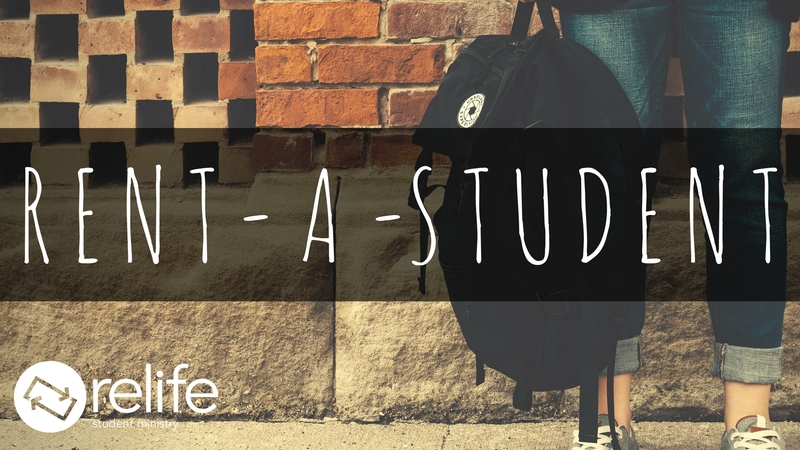 We are sponsoring "Rent-a-Student" as an easy fundraiser that connects students with people in our Church community who are willing to pay for some help with chores, special projects, yard work, etc! By hiring a Student for $10/hr (tips appreciated), you can get the help you need and help a student get to camp. Fill out the form below to be contacted to see how you can Rent-A-Student!